Christians in Iraq are rebuilding their lives with micro-loans that enable them to build businesses to provide a stable, sustainable future for their families. The loans, funded by Open Doors and distributed by churches and local partners, fund businesses as diverse as honey production, barbers shops, farms and shoe shops. Loan recipient Artin, 19, a barber in Al Qosh, a Christian town near the Nineveh plains, said: "Many Christians are leaving Iraq. They see no future here. I myself was one of them. I travelled to Turkey, looking to migrate, but I just missed my people too much. I decided to come back." Artin can now make a decent living as a barber. The small business helps him to stay and build a future in Iraq. And he is also helping other displaced Iraqis through it. "They can get a haircut for a reduced rate, and currently I am training two refugees to become barbers themselves. As soon as they have mastered the skills, they will be able to open their own shop, so they can make a living as barbers." As people return to their homes, help like this will be increasingly vital as much of the infrastructure has been destroyed. Each loan is overseen by a local committee which demands a business plan that is closely scrutinised before the loan is authorised and the project starts. In another part of Al Qosh, Nashwan runs a shoe shop out of a shipping container. 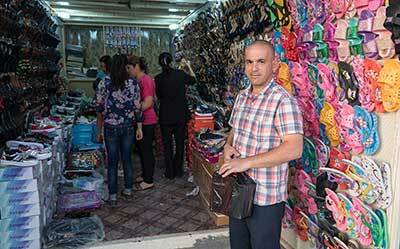 Formerly a successful shoe shop owner in Baghdad, the Christian businessman was forced to flee after Muslim extremists threatened his life. The container is stacked from top to bottom with brightly coloured shoes and sandals and is full of customers. Most of the shoes cost only a few dollars per pair. "This is my business strategy," Nashwan explains, while helping a lady pick the right sized sandals. "I try to sell a lot while keeping the prices low. Most of my customers are displaced people; they don't have a large budget. Through this I can support them." Life is still hard, Nashwan says: "I work long days and the profit is low. But I am safe here and I am making a living, I don't complain. It won't be easy and it will be hard work. But I still have a hope there is a future for us here." The goal of the Open Doors-supported Social Economic Development (SED) programmes is to support the Church in Iraq by supporting individual (Christian) Internally Displaced People with small loans up to $7,000 (about £5,500). This enables them to start up small-scale income generating activities and improve their situation. In this way people can support their families and rebuild their lives. The preferred approach for granting these loans is to work through local committees of volunteers. This ensures a personal connection with the beneficiaries and enables the programme to be strongly embedded in the community. Iraq is number 2 on the Open Doors World Watch List, which ranks the severity of persecution faced by Christians in 50 countries. Open Doors is working through local partners and churches in Syria and Iraq to provide crisis relief, trauma training, biblical training for church leaders, socio-economic development projects such as microloans for displaced people, and distributing Bibles and Christian literature. This year, Open Doors has launched the Hope for the Middle East campaign, a global, seven-year campaign mobilising Christians around the world to stand with the church in the Middle East. As part of this, Open Doors is asking people to sign the One Million Voices of Hope petition, which will be presented to the UN in June 2017. The petition calls for equality, dignity and responsibility for Christians and other minorities in Syria and Iraq, the key things Christians and church leaders from these nations have said they want for the future.